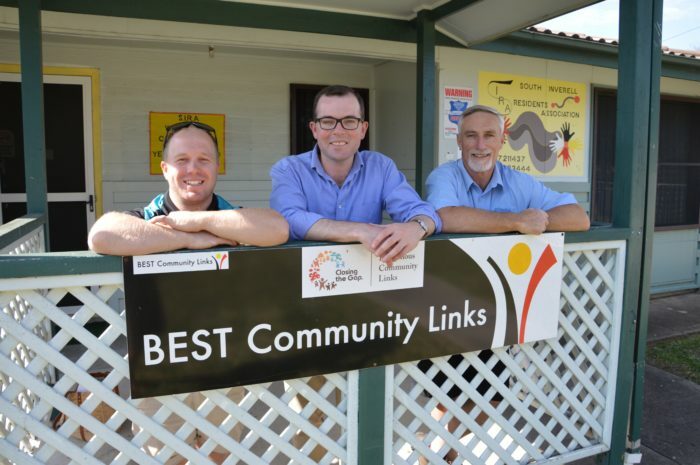 Linking Together Community Officer Brock Hobday, left, Northern Tablelands MP Adam Marshall and Inverell Shire Mayor Paul Harmon outside the soon-to-be renovated former Linking Together Centre in Waratah Street yesterday. NORTHERN Tablelands MP Adam Marshall today announced $48,125 in State Government funding for Inverell Shire Council to renovate a community space to create a new youth drop-in centre in South Inverell. Mr Marshall was in Inverell yesterday to deliver the good news to Inverell Shire Mayor Paul Harmon and discuss the details of the project, which is aimed at local young people and the entire community. “The council is planning to renovate the former Linking Together centre in Waratah Street to create a drop-in centre for youth-at-risk,” Mr Marshall said. “The building was originally a three-bedroom home so they intend to tear down a few of the interiors walls and create an informal space for youth gatherings. The house was the original Linking Together Centre and is directly across the street from the new facility so it’s perfectly located for its new purpose. “The community has been calling for a PCYC to be built in the area and this is first step in gauging the need and demand for such a facility in Inverell. Mr Marshall said the funding had been made available through the government’s Social Housing Community Improvement Fund (SHCIF), which makes available one-off grants of up to $50,000 for councils, not-for-profit organisations and private sector organisations. “The funding from the SHCIF not only improves community facilities, but brings tenants, neighbours and the wider community together,” he said.